NWSS Simmental Female Show Official Results– Click to download! 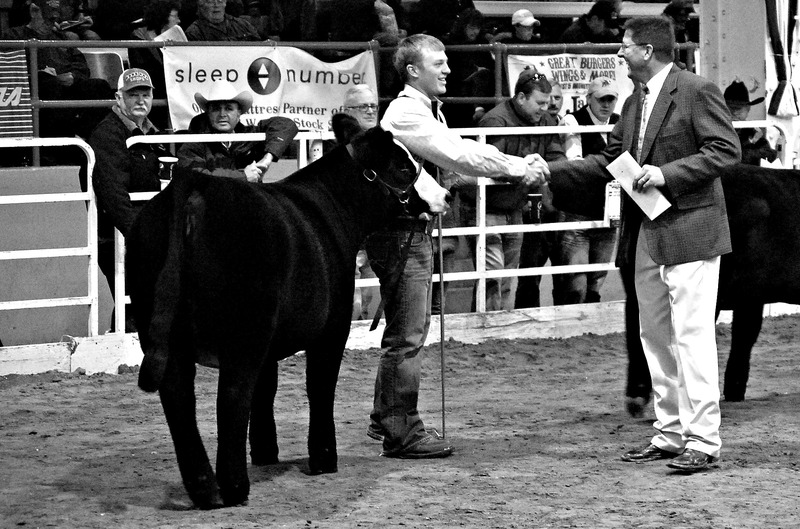 Posted on January 18, 2012 Categories 2012 NWSSLeave a comment on NWSS Simmental Female Show Official Results– Click to download! Check out the American Simmental Association on Facebook for complete coverage of all the Simmental events this week at the National Western Stock Show! Posted on January 18, 2012 Categories 2012 NWSSLeave a comment on Looking for pictures? Class 301: Tingle Farms of New Castle, Kentucky with an October 16, 2009 JF Shock and Awe 6207S daughter, Silverstone LPC Miss Awe. Class 302: Madison Wilkins of Loveland, Colorado with a May 15, 2009 GWS/SCF Rendition daughter, Miss Omy Sweet Calf. Champion Cow/Calf: Tingle Farms of New Castle, Kentucky with an October 16, 2009 JF Shock and Awe 6207S daughter, Silverstone LPC Miss Awe. Reserve Champion Cow/Calf: Madison Wilkins of Loveland, Colorado with a May 15, 2009 GWS/SCF Rendition daughter, Miss Omy Sweet Calf. Class 402: Hill Country and Ridinger of Fountain Run, Kentucky with a May 28, 2011 SS Ebonys Grandmaster daughter, Hilco Pride and Joy 301Y. Class 403: Lone Tree Simmentals of Columbia, Missouri with an April 4, 2011 CLO LTS Entourage 72T daughter, LTS Confessions. Class 404: Taylor Hale of Galatia, Illinois with a March 18, 2011 CNS Pays to Dream T759 daughter, Miss Dreamin 1011Y. Champion Spring Heifer Calf : From class 404, Taylor Hale of Galatia, Illinois with a March 18, 2011 CNS Pays to Dream T759 daughter, Miss Dreamin 1011Y. Reserve Champion Spring Heifer Calf: Second from class 404, Hunter Gregg of Bicknell, Indiana with a March 3, 2011 LMF Movin Forward daughter, C Bar Mabel 106Y. Class 405: Trennepohl Family Farm of Middletown, Indiana with a February 13, 2011 SVF Steel Force S701 daughter, STCC Steel Vanity 1037. Class 406: Hudson Pines Farms of Sleepy Hollow, New York with a January 1, 2011 Leachman Saugahatchee daughter, HPF Bram Lucy Y001. Champion Winter Heifer Calf: Trennepohl Family Farm of Middletown, Indiana with a February 13, 2011 SVF Steel Force S701 daughter, STCC Steel Vanity 1037. Reserve Champion Winter Heifer Calf: Hudson Pines Farms of Sleepy Hollow, New York with a January 1, 2011 Leachman Saugahatchee daughter, HPF Bram Lucy Y001. Class 407: Lindsey Ferguson of Chardon, Ohio with a November 25, 2010 GWS Ebonys Trademark 6N daughter, FSCI Tradin Up. Class 408: Pleasant Hill Farms of Rockfield Kentucky with an October 13, 2010 TWCC Trendsetter T71 daughter, Miss CCF Sassy X200. Champion Fall Heifer Calf: Pleasant Hill Farms of Rockfield Kentucky with an October 13, 2010 TWCC Trendsetter T71 daughter, Miss CCF Sassy X200. Reserve Champion Fall Heifer Calf: Second from class 408, Macgregor Livestock Farms of Doylestown, Ohio with a September 4, 2010 SHS Navigator N28 daughter, HPRP Ms Traveler 079X. Class 410: Drake Simmental of Centerville, Iowa with a May 10, 2010 Drake In Command daughter, Drake Blog X3. Class 411: Jones Show Cattle of Plymouth, Illinois with an April 22, 2010 SVF Steel Force S701 daughter, TJSC So Sweet 104X. Champion Junior Heifer: Jones Show Cattle of Plymouth, Illinois with an April 22, 2010 SVF Steel Force S701 daughter, TJSC So Sweet 104X. Reserve Champion Junior Heifer: Second from class 411, Rex Standridge of Lindsay, Oklahoma with an April 4, 2010 SVF Steel Force S701 daughter, Ratcliff Steel Miss 308X. Class 412: Gehrke Farms of Hartsburg, Illinois with a March 23, 2010 SVF/NJC Built Right daughter, GXC Built Rt Blackbird 1X. Class 413: Grass Lunning Simmentals of Le Roy, Minnesota with a January 29, 2010 SP The Answer 813 daughter, GLS Miss Answer X50. Champion Senior Heifer: Gehrke Farms of Hartsburg, Illinois with a March 23, 2010 SVF/NJC Built Right daughter, GXC Built Rt Blackbird 1X. Reserve Champion Senior Heifer: Grass Lunning Simmentals of Le Roy, Minnesota with a January 29, 2010 SP The Answer 813 daughter, GLS Miss Answer X50. Champion Percentage Heifer: Gehrke Farms of Hartsburg, Illinois with a March 23, 2010 SVF/NJC Built Right daughter, GXC Built Rt Blackbird 1X. Reserve Champion Percentage Heifer: Pleasant Hill Farms of Rockfield Kentucky with an October 13, 2010 TWCC Trendsetter T71 daughter, Miss CCF Sassy X200. Click to download today’s complete official results! Judging today’s Percentage and Purebred bull show we have Dr. John Edwards of Stephenville, Texas with associate judge, Tom Hook of Tracy, Minnesota. Class 101: C Bar Cattle Company Inc., of Owensville, Indiana with a May 11, 2011 HHF Pay Day son, C Bar Pay Off 108Y. Class 102: Hearthstone Farm of Urbana, Ohio with a January 5, 2011 Hearthstone Tuscan son, PFK Tuscan 26Y. Class 103: Lee Simmental Farms of Columbia, Missouri with an October 3, 2010 B C Lookout 7024 son, LLSF Lookout X4. Champion Bull Calf: From class 101, C Bar Cattle Company Inc., of Owensville, Indiana with a May 11, 2011 HHF Pay Day son, C Bar Pay Off 108Y. Reserve Champion Bull: Second place from class 101, Oak Meadow Farm Simmentals of Harmony, Minnesota with a March 3, 2011 CJ SH Liquid Asset 8660 son, OMF Commander Y69. Class 105: Puett’s Simmental Ranch of Manhattan, Kansas with a May 5, 2010 OHL Remmington 217 son, Puetts Bull Xu3. Class 106: Ruth Simmentals of Rising City, Nebraska with a January 1, 2010 SVF Steel Force S701 son, BF Mr Confidence. Champion Junior Bull: Ruth Simmentals of Rising City, Nebraska with a January 1, 2010 SVF Steel Force S701 son, BF Mr Confidence. Reserve Champion Junior Bull: Second from class 106, Hill Country & Ridinger Cattle of Deer Trail, Colorado with a January 14, 2010 SS Ebony’s Premium Blend son, Hilco Power Booster 21XX. Champion Percentage Bull: Ruth Simmentals of Rising City, Nebraska with a January 1, 2010 SVF Steel Force S701 son, BF Mr Confidence. Reserve Champion Percentage Bull: Hill Country & Ridinger Cattle of Deer Trail, Colorado with a January 14, 2010 SS Ebony’s Premium Blend son, Hilco Power Booster 21XX. Class 201: Madison Wilkins of Loveland, Colorado with a July 11, 2011 SVF/NJC Built Right N48 son, Built On Daddys Money. Class 202: K-LER Cattle Company of St. Charles, Minnesota with an April 8, 2011 3C Macho M450 BZ son, K-LER Young Money. Class 203: Hudson Pines, Arnold Farms, and Brown Farms with a March 17, 2011 ZKCC Chopper 844U son, Brooks Hombre. Champion Junior Bull Calf: K-LER Cattle Company of St. Charles, Minnesota with an April 8, 2011 3C Macho M450 BZ son, K-LER Young Money. Reserve Champion Junior Bull Calf: Hudson Pines, Arnold Farms, and Brown Farms with a March 17, 2011 ZKCC Chopper 844U son, Brooks Hombre. Class 204: Forest Brook Farms, LLC of Chilton, Wisconsin with a February 17, 2011 SVF Steel Force S701 son, FBF1 Combustible. Class 205: Circle M Farms of Rockwall, Texas with a January 28, 2011 CNS Dream On L186 son, WLE Swagger Y770. Class 207: Lee Simmental Farms of Columbia, Missouri with an October 20, 2010 STF Shocking Dream SJ14 son, SS/PRS Gunslinger 824X. Champion Senior Bull Calf: From class 205, Circle M Farms of Rockwall, Texas with a January 28, 2011 CNS Dream On L186 son, WLE Swagger Y770. Class 210: Trennepohl Family Farm of Middletown, Indiana with a March 20, 2010 STF Shocking Dream SJ14 son, STCC Long Haul 033X. Class 211: Circle M Farms of Rockwall, Texas with a February 25, 2010 LBS The Foreman 702T son, OBCC GCC Brushcreek C47X. Champion Junior Bull: Trennepohl Family Farm of Middletown, Indiana with a March 20, 2010 STF Shocking Dream SJ14 son, STCC Long Haul 033X. Reserve Champion Junior Bull: Brooks Cattle Company of Calumet, Oklahoma with a March 20, 2010 SVF Steel Force S701 son, Brooks Big Iron X057. Class 212: Foster Brother Farms of Lockney, Texas with a November 11, 2009 SVF Steel Force S701 son, FBFS Wheel Man 649 W.
Class 214: Trennepohl Family Farm, Hege, and Rolling Hills of Middetown, Indiana with a January 8, 2009 JS Burning Up 33R son, Triple C Opportunity. Champion Senior Bull: Foster Brother Farms of Lockney, Texas with a November 11, 2009 SVF Steel Force S701 son, FBFS Wheel Man 649 W.
Reserve Champion Senior Bull: Trennepohl Family Farm, Hege, and Rolling Hills of Middetown, Indiana with a January 8, 2009 JS Burning Up 33R son, Triple C Opportunity. Champion Simmental Bull: Foster Brother Farms of Lockney, Texas with a November 11, 2009 SVF Steel Force S701 son, FBFS Wheel Man 649 W.
Reserve Champion Simmental Bull: Circle M Farms of Rockwall, Texas with a January 28, 2011 CNS Dream On L186 son, WLE Swagger Y770. National Western Simmental Bull Show Programs– Available Online! Posted on January 17, 2012 Categories 2012 NWSSLeave a comment on National Western Simmental Bull Show Programs– Available Online!